Beautiful birdlife, interesting insects, rare reptiles, magnificent mammals – our gardens can act as enriched havens for local wildlife. Whether you’re in a city, suburbs or rural location, we’ve brought together some great tips for creating a rich habitat of fascinating fauna on your precious patch of Great Britain. Do take a look at our British Wildlife Garden pinterest board to get a sense of the breadth of species ready to roam our gardens. With British wildlife species worryingly in decline over the last 50 years, it’s never been more important to do our bit in building and maintaining our own mini ecosystems to support British wildlife. Seriousness aside, everyday wildlife watching is enormously rewarding. Build it and they will come! First, assess the structure of the garden from the animals’ eye view. Are there plenty of places to perch for birds like robins and blackbirds to defend their territories? Is it easy for slug-busting hedgehogs to move between gardens on foraging forays? Are there safe spots to feed, nest and hibernate? As well as being such attractive elements in any garden scheme, Garden arches are wonderful for wildlife. 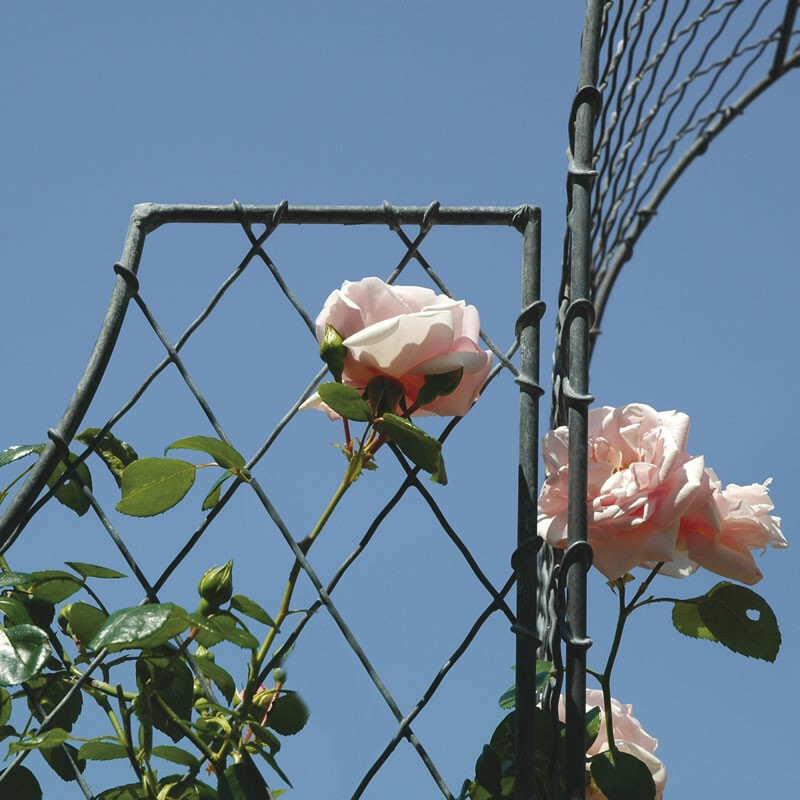 Garden Requisites sturdy English wirework structures can be planted with quick-growing climbers that provide cover and food for insects and birds. High points for surveying territories, arches can also be hung with bird feeders and the galvanised steel wirework is fortuitously tricky to climb for opportunist cats. Installing some sturdy metal garden trellis wherever you can is also a great way to create high-reaching support for dense climbers, ideal for nesting and, if well chosen for berries, seasonal snacking. If your garden is walled rather than hedged, to further shelter the garden, provide way finding foliage for wildlife (and increase privacy from your neighbours), consider some wall-top garden trellis. As part of an ideal garden ecosystem, you’ll be needing some natural slug slayers! We’re more than happy to include hedgehog-sized portals along the base of a our made to order trellis panels for fencing. Make sure your garden is open for business to these helpful creatures. As all the home building for creatures tips are too many to mention here, for a generous seam of wildlife gardening knowhow, including how to make garden ponds, bird boxes, bat boxes, insect hotels, you name it, do take a look at the RSPB’s brilliant Give Nature a Home advice. Their neat online project planning aids mean you can also tick off projects as you go. In particular we’d like to mention hedgehogs here as the population has been dwindling so dramatically. There were 30 million hedgehogs in the UK in the fifties and just 1 million now. We’re so lucky if they come to our gardens so try and be ready with a warm welcome when they do. Getting a hedgehog home and habitat in place in the summer means it will be ready when hedgehogs are house hunting in the Autumn. There are so many wildlife plants that are beneficial to different species of bird, insect and mammal. It’s not necessary for the whole planting scheme to be wildlife focused but a good tip is to include some natural food options in the mix – bushy native species such as Hawthorn, Crab Apple, Dog Rose and Elder are always wildlife winners. Pyracantha, Ivy, Berberis and Cotoneaster are also wonderful sources of berries in the winter. As well as popping into frost-proof planters some early nectar-rich spring bulbs & corms such as Crocus, Aconites, Grape Hyacinths and Snowdrops, planting flowers for Spring/Summer blooming will attract pollinating insects – also a bonus if you have fruit trees. The possibilities for bee and butterfly-friendly planting are many. Honeysuckle is glorious as a trellis climber and will be covered with bees in the summertime. Lavender, Buddleia, Verbena bonariensis, Echinops, Eryngium and Bergamot (Monarda or Bee balm) are also all perfect plants for pollinators – rewarding for humans too! By default, adding new planting zones can create cover for a variety of garden fauna and, with carefully selected plants, seasonal food. Consider new borders with beneficial shrubs, perennials and annuals. Leave seedheads such as Lavender, Poppies, Echinops & Teasel for as long as possible in the winter. Birds, especially finches, will love these. We could go on for a good few hundred words more but hope this gets readers thinking about enhancing the wildlife framework of the garden. Oh, and don’t forget to ask us to include the hedgehog holes in fencing!